Overgrowth of yeast and bacteria can cause otitis (an inflammation or infection of the ear). And ear infections are no laughing matter. If not properly treated an ear infection can cause your dog pain, balance problems, and even hearing loss. So inspecting and cleaning your Schnauzer's ears weekly is a very good idea. 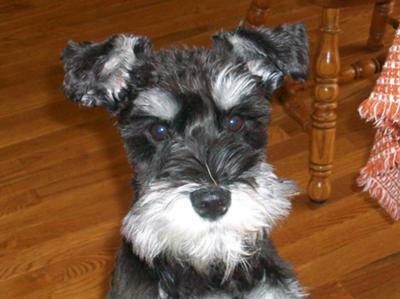 So how can you tell if your Schnauzer is having issues with its ears? Trust me, you'll know. Signs of Ear Trouble It will not be difficult to tell when your Schnauzer is having ear troubles. The behaviors and symptoms will be too hard to ignore. If your Schnauzer demonstrates any of the symptoms or behaviors above, it's time for a vet visit to seek professional advice. So even though most dogs would prefer you... leave their ears alone when it come to cleaning them... the more often you do it (weekly is best) the more accustom your Schnauzer will become to the process making it that much easier on the both of you. Most Miniature Schnauzers don't like having their ears cleaned but as mentioned above, it is a necessary and important part of caring for your dog. Since the hair inside the ears continues to grow, it must be plucked periodically. If neglected and the hair grows long inside the ear canal, wax and dirt will cling onto it and build up. As this continues, air will not properly circulate through the area to keep it dry. Moisture will remain trapped inside the canal creating the perfect environment for yeast and bacteria overgrowth, resulting in an internal ear infection. But with regular cleanings and weekly inspections, your Miniature Schnauzer's ears will result in a healthier, happier pet as well as allow you the opportunity to detect the beginnings of any troublesome conditions brewing early on. • Prepare Supplies: First gather up all the grooming supplies you will be using so they are right at your finger tips: dog ear wash solution, dog ear powder, cotton balls, pair of tweezers or hemostat, and Qtips. • Inspect the Ears: The first thing you want to do is inspect your dog's ears. Look at both the outer and inner ear flaps. You are checking for any abnormal signs like excessive wax, debris, mites, fleas, inflammation, discharge or funky smell. A healthy Schnauzer's ears will always be pink and smell nice. Dog Tip: Even if you choose to clean your dog's ears every other week, you should still perform the weekly inspection to detect signs of an infection or other problem early on, that could require medical attention. • Pluck Out Inner Ear Hair: Next, take your tweezers or hemostat and pluck the hair out of the inner ear canal. You must be very careful in doing so as you do not want to cause injury. If you are not comfortable using an instrument, just use your fingers. Simply grab onto the inner hair and give a quick tug. See Removing Dog Ear Hair video. If done correctly this process is not painful to your dog. You should NEVER pull on any of the hair of the ear flaps, only the hair inside the ear canal. To make it a bit easier, you might want to use some dog ear powder to help you grasp hold of the hair. The goal is to remove just a small amount anyways since the hair after all, is there for a reason. So pluck out just enough ear hair to let the air circulate and to prevent it from knotting or matting which could cause debris to accumulate inside the ear canal. • Ear Wash: Next, use a Qtip or cotton swab to clean the outer ear canal only. Moisten the cotton ball with a dog ear wash solution or a homemade solution for cleaning dog ears. NEVER insert a Qtip inside your Schnauzer's ear canal. Doing so could cause permanent damage to the ear drum. Again, you are only wiping the earflap and opening into the canal as far as you can see. Do not probe deep inside. If there is no evidence of wax accumulation or foul smell, a light swabbing is enough. 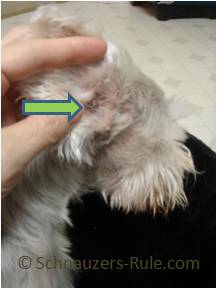 note: For deeper cleanings (ie adding drops inside the ear) do so only after advising with your Schnauzer's veterinarian. If allowed, add a few drops of solution and gently massage the base of the ear to distribute it thoroughly. Then use the cotton balls to remove any discharge. Also allow your Schnauzer to shake his head in an attempt to remove the excess liquid. 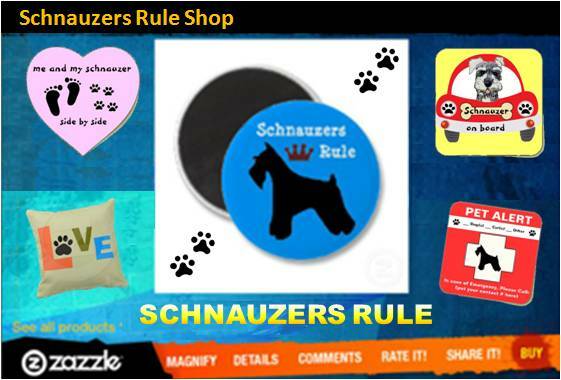 • Dry Ears Completely: Always be sure to dry your Schnauzer's ears completely. Use a soft towel or put your blow dryer on its lowest setting to achieve this. You should clean and inspect your Schnauzer's ears weekly and pluck the inner ear hair out when needed. For easy weekly maintenance, you might want to try pre-moistened ear wipes or swabs. 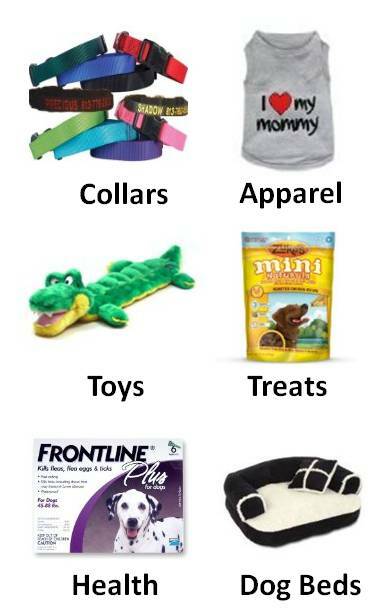 Here are a few alternatives to store bought solutions that work just as well in cleaning dog ears. Witch Hazel - A natural astringent and disinfectant that soothes sores and works as an anti-itch remedy. Vinegar & Water - Just prepare equal parts of both vinegar and water to clean all around your dog's ears. Good for infections brought about by yeast overgrowth. Hydrogen Peroxide & Water - Prepare equal parts of hydrogen peroxide and water. This remedy works well on getting rid of wax build up and dirt. "Knowledge Share"... If you found this article on dog ear cleaning helpful and informative, please share it with your dog-loving friends by clicking on one of the share links (like facebook, twitter, and google +1) located at the top right or bottom of this page.